February 15, 2018. In its 28th annual New York State budget briefing book, the Fiscal Policy Institute analyzes and comments on Governor Andrew Cuomo’s FY 2019 Executive Budget. February 9, 2018. New York State has a long and proud history of trailblazing innovative policies that expand access to healthcare coverage to all its residents. From developing and establishing the nation’s first comprehensive health insurance program for children to the launch of the New York State of Health Marketplace under the Affordable Care Act, New York has often been a national leader in expanding access to quality affordable health coverage. February 7, 2017. In its 27th annual New York State budget briefing book, the Fiscal Policy Institute analyzes and comments on Governor Andrew Cuomo’s FY 2018 Executive Budget. February 3, 2016. In its 26th annual New York State budget briefing book, the Fiscal Policy Institute analyzes and comments on Governor Andrew Cuomo’s FY 2017 Executive Budget. September 19, 2013. 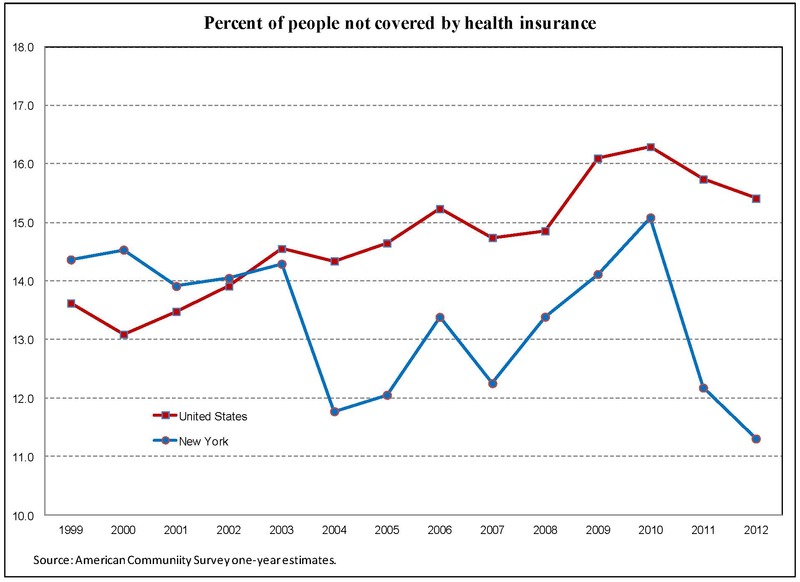 The percentage of New Yorkers without health insurance dropped for the second year in a row from 12.2 percent in 2011 to 11.3 percent in 2012 (+/- .5 percent) according to estimates released by the Census Bureau two days ago. Overall, the number of people without health care coverage across the state dropped to approximately 2.2 million people in 2012. September 20, 2012. After years of watching the number of New Yorkers without insurance climb higher and higher, we are finally seeing the trend reverse, thanks to health care reform and Medicaid. The data released today by the U.S. Census Bureau underscores the urgency for New York to implement health care reform.